The eventual battle to get to the Scary Stories to Tell in the Darkbooks during our weekly trips to the library during elementary school always resulted in hectic frenzy; imagine group of rabid children grabbing whichever book was available at the time and of course, if one of them wasn’t available, it was a race to see who can reserve the book for eventual glory. The reserve list for these books got to levels of pure ridiculousness, with wait times going as far a couple months! I remember I started to question why these books were so popular. Perhaps it was scorn for the fact that I rarely got the books themselves or even on the reserve list or maybe it was a foreshadowing to my inner hipster that starts to not like things simply because they were suddenly popular but I found myself starting to drift away from the series that I held so dear. Cut to a random lunch in elementary school. I remember sitting down and opening the standard paper bag lunch and remembering that my mother was currently on a recent Hostess phase. I had no problem with these treats but even as a young child, I thought these things were just TOO DAMN SWEET. Today’s offering contained Snowballswhich was a cupcake wrapped in marshmallow and covered in coconut (for real, this was a thing, actually, I think it’s still a thing)! Now, I know for a fact that a lot of kids were nuts about this stuff so I was ready for the sacred childhood tradition of trading. This time however, my eyes darted to not food but a black book containing a ghoulish illustration of a dark forest. This was it, I had the chance to obtain the second offering in the trilogy of books that were coveted by children all over. The target was a classmate who happened to look like the personification of a Hostess product (don’t get me wrong, I also fit that description but for the sake of the trade, I knew this was advantageous) and I knew if I played my cards right he’d happily hand over the book for at least a couple days. I was able to use my (questionable) charm and convince the person to lend it to me for the rest of the week in exchange for my snowball snack along with one other future Hostess product that I’m sure would find its way into my bag at some point. 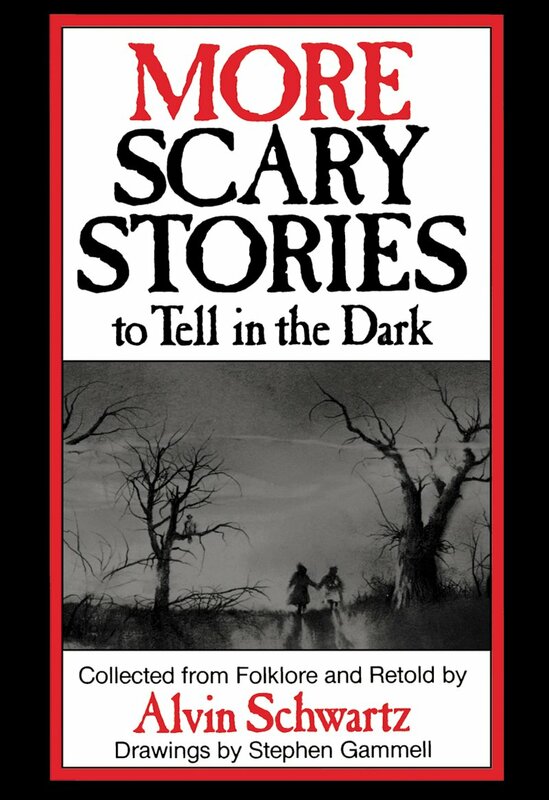 I remember running with the book to the nearest shady area with a picnic bench and spent the rest of my lunch recess flipping through the stories to check out which story had the creepiest illustration. More Scary Stories to Tell in the Darkfollowed the same format as the previous collection of stories but I did notice a subtle difference in the illustrations; where the first book seem to have a fairy tale feel to its illustrations seeing that this book was (surprisingly) made for children, I had noticed that this series had a darker tone. There was more shadowing in the illustrations that seemed to elude to more violence/blood which made these stories even more intense. Although a children’s book, the slight level of maturity made it seem like the first book was a child and the sequel felt more like a pre-teen flirting with more sinister illustrations. The story themselves kept to the same themes of jump-scares, laughs and even kept the tradition of teaching the story-reader a song or two; complete with sheet music which was a blast for someone like me who actually knew how to play the piano! Check out some of my favorite entries based on the story and/or FEARtastic illustrations! Hands down, this story makes my top 5 in all the series. The illustration itself is stuff of nightmares; an old rotting corpse of a lady with shiny eyes that seem to peer into your soul. The story itself was a cautionary tale of grave robbing gone wrong but it was clearly made to tell with a group of people since it even gave instructions on when to pounce on the unsuspecting listeners! This was the kind of story that made you not want to open the utility closet door or the top cabinet that’s rarely used. 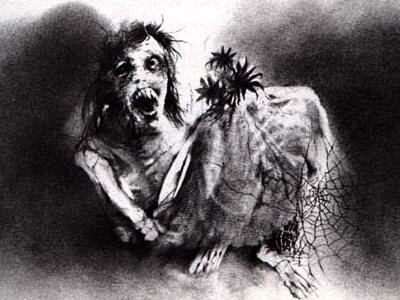 The illustration of what seemed to be a screaming corpse was simultaneously cool yet disturbing because it looked like the damn thing was staring right at you! This one was purely for the illustration. For a silly story, the illustration was quite artistic. 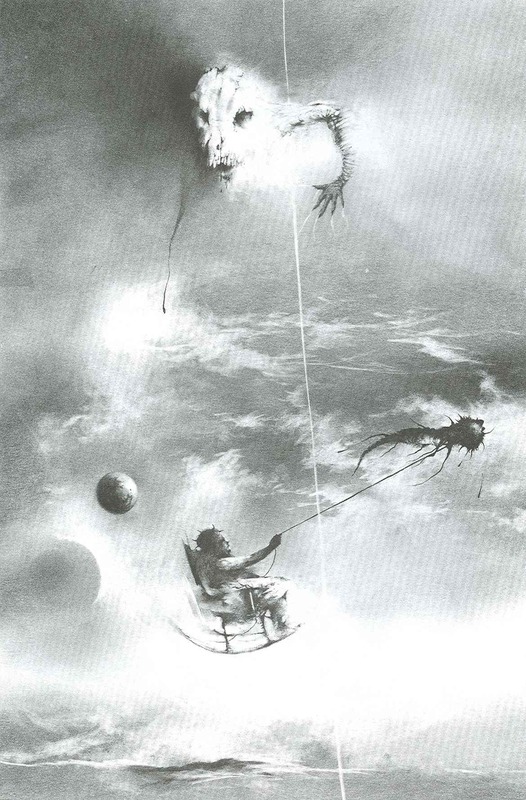 Not sure what Stephen Gammell was going for with this piece but the random skeleton demon from the sky looking down at a ghoul being pulled by what looks to be a giant eyeball is very appealing to me. 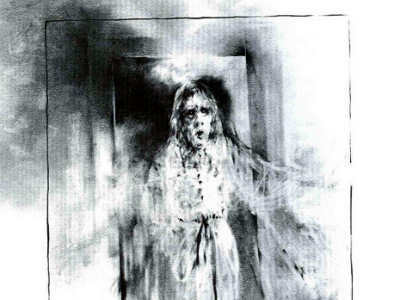 Out of all the illustrations in the series of books, this would be the one that I would hang on my wall. Creepy yet…artsy? While Oh Susannahwas the one of the most beautiful illustrations in the series, this story’s illustration was as ridiculously silly as the story. 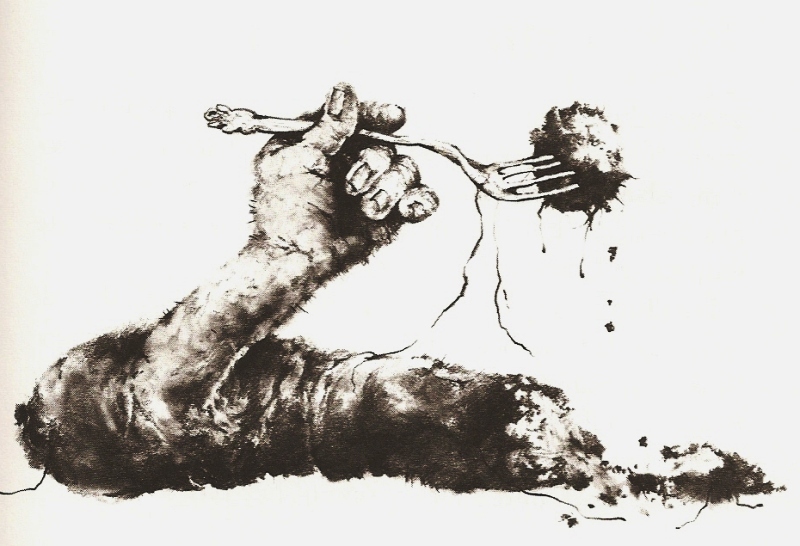 Although the story was quite entertaining, the vision of a hand protruding from a sausage equipped with a fork elevated the tale to another level. The esthetic was particularly disturbing since the sausage itself seemed to suggest this may have been a bloody sausage which kept in line with the darker tone of the series. Life is FAR more interesting when we take interest in things that scare us.